Dit huisje is in een prachtige locatie. Het ligt op een granieten klif met uitzicht op de oceaan, met meer dan 180 graden van een spectaculair uitzicht op het water. Het is op 3 hectaren, en is het enige huis op de oceaan kant van de weg, het verzekeren van privacy en vrij uitzicht. Dit is prime Nova Scotia oceaan voorgevel. De uitzichten zijn onovertroffen. Nieuw voor 2018- Nieuwe slaapkamer suite met ligbad en nieuwe wasruimte, een vaatwasser en nieuwe keukenkasten! Je zou in een rustige oceaan toevluchtsoord, maar Halifax, een grote internationale stad ligt op slechts 20 minuten! Prospect is ook ongeveer 10 mijl van de belangrijkste toeristische bestemming van Peggy's Cove, dat is een schilderachtig dorpje aan zee, met een veel bezochte vuurtoren op een granieten kust. Prospect is een oceaan vissersdorp. Het dorp is vrij rustig, maar de mensen zijn erg vriendelijk en kunnen hun manier van leven met je delen. Waterkant recreatie vol met alles van kajakken op zee te zeilen, waterskiën, motorboot varen, vissen en walvissen spotten. Er is een twee mijl stuk van onontwikkelde openbare grond ('kroondomein', zoals het nominaal is eigendom van de koningin van Engeland), direct naast het huisje, dat is een fantastische plek om te lopen, rennen mountainbiken of wandelen. De kust is spectaculair om mee te rijden met de vele pittoreske dorpjes zoals Peggy's Cove, Lununberg, Mahone Bay en Chester in de buurt. Restaurants zijn er in overvloed, met heerlijke zeevruchten. Halifax is een grote internationale stad en heeft de eerste klasse activiteiten en attracties, met inbegrip van Keltische muziek, professionele sport en entertainment, de Citadel fort, een charmante waterkant, en een uitstekend nachtleven. Dit is een eenvoudige, maar netjes en comfortabel huis met alle basisvoorzieningen, en vervolgens een aantal, op een spectaculaire locatie. Ik voortdurend updaten / upgraden. Het heeft gratis Wi-Fi internet en kabeltelevisie. Nieuwe Master Suite 2018. Nieuwe wasruimte 2018. Als u op zoek bent naar 5-sterren resort accommodaties, is dit niet voor u! Maar als u wilt worden omringd door prachtige oceaan in uw prive-uitje, terwijl nog steeds een belangrijke internationale stad in de buurt, je zal heel blij. Het huisje is het beste voor 4-6 personen, maar er zijn een paar bedden op de onafgemaakte zolder. Let voorheffing van 15% Nova Scotia en Canada. Pet fee $ 100 / huisdier. PRIJZEN ZIJN IN USD. Als u wilt betalen in $ CDN, laat het me weten en we zullen voor die tijd een conversieratio berekenen. Prachtig uitzicht vanaf het dek. Very cozy house right on the Nova Scotian coast! Just as advertised. Right on the coast line. Love the way Canadians are in to recycling. All was GREAT!! Everything as described and depicted and more! So beautiful and peaceful! Where do I begin? This property is located in a perfect location. 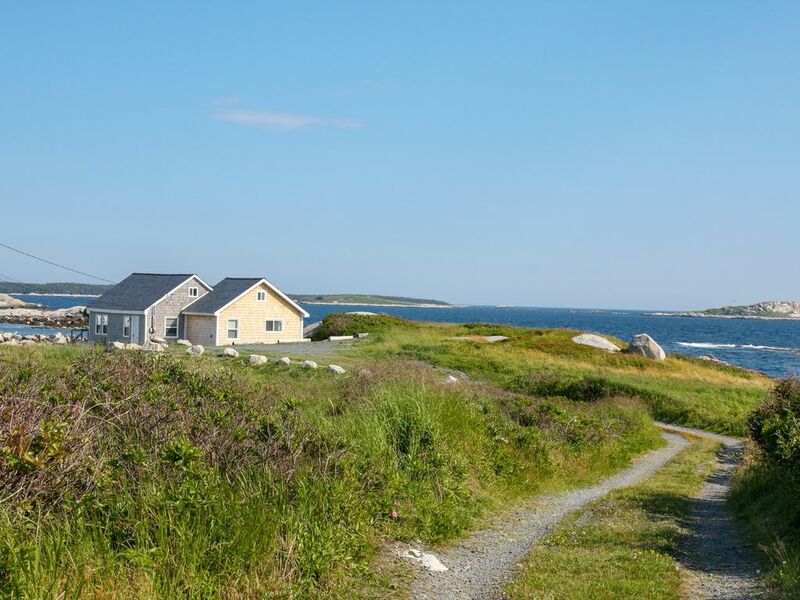 Beautiful views, a park just a few steps away, a short drive away from Halifax... The cottage had everything we needed for my husband, chihuahua and myself. We had a great time and hope to come back even though we live in NC! You will not regret staying here. It is a vacation we will remember for the rest of our life, traveling across New Brunswick and Nova Scotia, and stopping here for four nights. What a trip! We loved it, peaceful, quaint, beautiful setting, stunning scenery from every room! We had a lovely stay in this oceanfront cottage. It was everything we hoped it would be...peaceful, charming, beautifully situated along the coast. Amenities were simple but comfortable. We were convenient to Lunenburg and Peggys cove as well as Halifax. We loved Mabel’s Market just up the road and Rhubarb. Highly recommend this property for those wanting to avoid the rush of the city, and who want to relax and unwind in a glorious setting! We have stayed in a lot of places around the world but this has been our favorite! It is gorgeous! The cottage location is perfect , overlooking the water. It is the last cottage on the point. The cottage itself is updated , clean and has everything you could need . We could lay in bed and watch the sunrise and every evening we sat out on the rocks till we could see the stars and Milky Way. We did day trips and saw a lot of Nova Scotia on the south end and across to Bay of Fundy. The people are very friendly and helpful. The lobster and Digby’s scallops were the best! I loved the wildflowers along the roads and in the meadows. I’ve never seen so much Queen Anne’s Lace. The only thing I didn’t like was having to leave. But be prepared for mosquitoes. There were nice trails from our cottage along the rocky coast that were fun. This was THE place to stay! We feel very fortunate to have found it. My husband and I stayed here for a week for a relaxation getaway. The cabin was perfect for two people and the views can not be beat. - No kitchen spices. We cooked a lot at the house and were expecting the bare minimums (salt/pepper/oil). But none were provided. Not a huge issue but was an extra trip to the grocery store. I would definitely recommend for someone looking to escape and just enjoy nature. My family and I had a wonderful stay at this cottage for a week this July! The views were honestly breath-taking and I couldn't believe the amazing hiking we were able to do just outside our doorstep! We've been to coastal Ireland before and this really reminded me of it! Besides the terrific views, this cottage was clean, cozy and had everything one needed for a great vacation. We loved sitting outside on the beautiful deck and it was also handy having a nice big tv and wifi if we wanted to relax inside. I would definitely return to this cottage if I were ever to visit Nova Scotia again. Halifax is een grote internationale stad met alles wat denkbaar is en ligt op slechts 20 minuten afstand. Maar, het huisje is adembenemend oceaan en voelt een wereld weg! Rates are subject to change until reservation is confirmed. Rents are non-refundable unless the period is re-rented under the same terms, in which case a refund will be made minus a $100 service fee. Pet fee, if applicable is $75/pet and is payable separate from the reservation.